So much has been written about rivers and though I am surrounded by several–the Klamath, the Rogue, the Smith, the Illinois– I am not a part of river-culture. I am not a kayaker nor a flyfisher, and prefer to take my swims in still bodies of water where I can float on my back eyes-closed and not find myself a mile downstream. All the same, I love rivers for their great beauty and because they are so candidly metaphoric: Life is a river, Go with the Flow, Water under the Bridge. Writers like Norman Maclean and David James Duncan floated whole books on this metaphor and rivers have meandered through many of the poems of my favorite poets, like What the River Says by the former Oregon poet-laureate William Stafford. And then there are the rivers in the poems by my friend Joe Chermesino, a lesser known but not lesser talented poet. 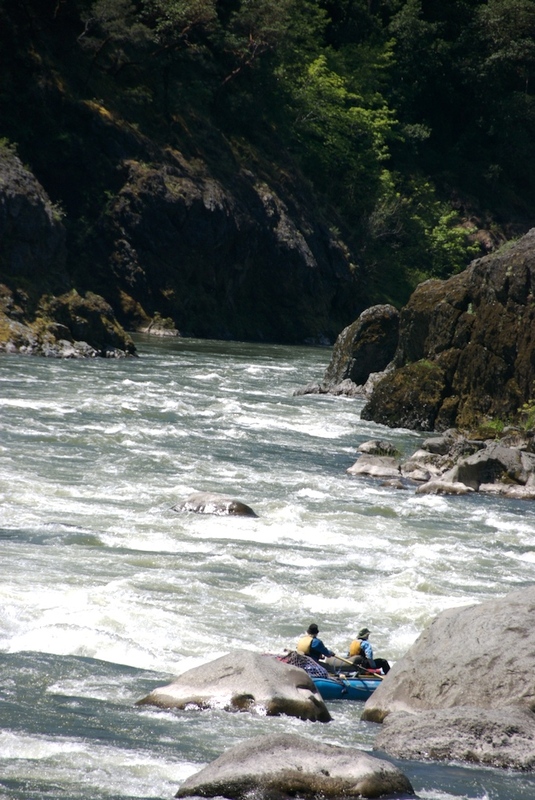 Last week I accepted a last minute invite for a four-day float trip down the Wild and Scenic section of the Rogue River. The trip was to celebrate the birthday of a wonderful guy named Dan but, in the end, I felt like it was my birthday; by the time I hopped on the trip all the packing and organizing had already been done, and throughout the trip Dan and his girlfriend Lynn insisted on setting up and cooking almost every meal for the rest of us. Each morning I woke to a riverside buffet of coffee, fresh fruit, bagels and omelets. For dinner, fish tacos, tortellini, hearty stews. Wine was poured, martinis were mixed in Nalgene bottles, enormous slices of German chocolate cake were distributed after dinner. We were all feeling grateful in mind and body that Dan was born. We spent the first night camped on a small sandbar. After staking out our tent settlement, a bald eagle flew low over our heads. Then another one. And then another. Though no longer officially threatened or endangered, to see one bald eagle is still a rare thing, much less three. It was a special moment and we knew it. We cranked our heads skyward in rapt silence as one eagle tried to chase off another, diving and swooping and showing its enormous wing span and cloud-white head. Our senses were wide awake: The sound of the river sharpened, the sky deepened. What luck! A good omen! Then the eagles reeled toward each other, locked talons, and tumbled near to the ground. We let out a loud collective gasp, as if wowed by the last firework display on Independence Day. The spooked eagles left. We sadly watched their disappearing tail feathers as they aimed downstream. But that wouldn’t be our last wildlife sighting. A curious young bear investigated our rafts. A river otter ambled along the shoreline. Fish surfaced. Deer hid in the riparian foliage. Fire newts spooned and mated in bogs. Herons held still. There were plenty of frogs to kiss. And then there were the ubiquitous, but always compelling ravens. I spent much of my time on lounging at the helm a raft rowed by Jeremey, a competent river guide from Jackson Hole, WY. Jeremey is on his way to Alaska for a season guiding on the Tatshenshini river. Our conversation revolved around the value of unstructured time, of nature, and of travel. The rest of the time I spent fending for myself in an inflatable kayak. I was surprised how scary it was to paddle some of the rapids. After a few runs, this bold pilot climbed ashore quaking like a shitsu. A great trip in all. A happy group of people varying nicely in age and interest but with the key things in common: a belief that time spent on rivers is never wasted time and that there is always space on the raft for more wine and cheese. And martinis. And chocolate cake.